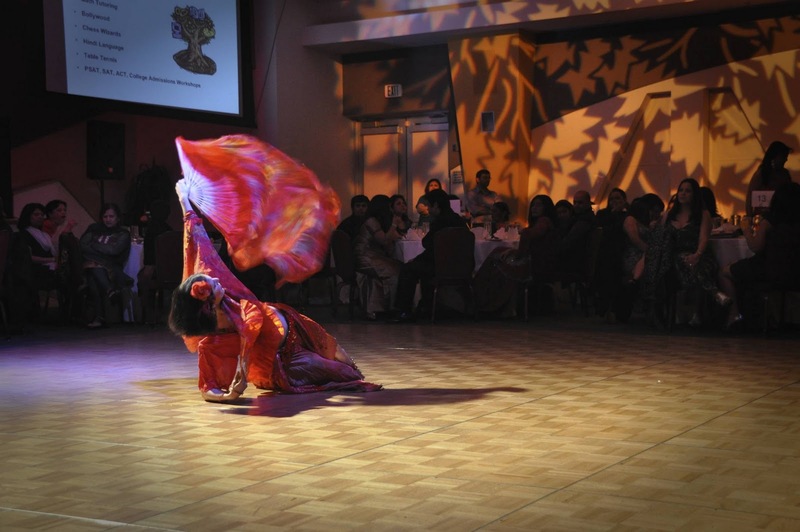 For NYE 2011, Fire Pixie was booked at the India Community Center in Milpitas to put on a New Year's Eve circus show. We rocked the house! Opening act was a belly dance solo by Miriam. 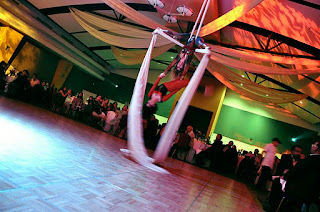 I absolutely love her fluttery fabric fans..
Our second act was an aerial tissu duet featuring Miriam and me. I was all kinds of excited about this. I've never done aerial for such a huge venue before and I was nervous as all get out. Since it was a new piece, we'd had a "preview party" at my house the week before the performance, so we could perform it in front of an audience before the big show on NYE. This upped my confidence level enormously. And it really worked! I had the jitters until I heard the first drumbeats of the music start, and then found myself transported to that magical timeless flow state, flying through the routine effortlessly, spinning and dancing, climbing and dropping, connecting with the audience. Moments like that are magical. This is why I choose this kind of life. After the show, the adrenaline rush took us right through the last set of the night, the fire show. I'll be honest.. we've done so many fire shows of this type that we don't even bother taking pictures anymore.. but we pulled it off with our usual aplomb and then made it back to Miriam's in time for a new year's champagne toast. Happy New Year! I want to hear about your NYE adventures too!